Identity theft is considered one of the fastest-growing crimes in the USA. In fact, over 9.9 million Americans have been victims of ID thefts, and have suffered huge financial losses. A lot of these crimes take place online, when people enter sensitive personal information on various websites. Offline, thieves go around neighborhoods and vandalize residential mailboxes to steal the mail. At first, you may not notice some of your mail is missing. But if your utility bills stop coming in or you stop receiving packages, you should start to worry. Getting a locking mailbox is a perfect solution to this problem. Not only will you have complete control over your mail, but you’ll also deter the thieves. Picking the locks on these mailboxes is very hard. Most potential thieves will give up before they even try. But not all locking mailboxes are made equal. Below, you’ll discover how to choose the best one for your type of mail. Before you buy a new mailbox, consider the type and size of the mail you receive. For example, if you mainly receive envelopes or magazines, you’ll need a standard-sized mailbox. If you receive packages or lots of mail, you may need a more spacious mailbox. Look for one that can hold several days’ or weeks’ worth of mail. Although you’re the only person who’ll have the keys to your mailbox, the mailman will still be able to deliver your mail through the incoming mail slot. This is why locking mailboxes are safer than regular ones. Whatever model you choose, make sure it complies with the USPS mailbox regulations. 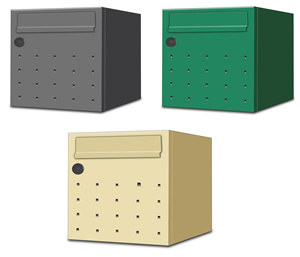 More and more people are choosing to install locking mailboxes in lieu of unlocked ones. If you want to protect your personal information from curious eyes and thieves, invest in a high-quality locking mailbox. Wondering where to start? We at National Mailboxes offer a large variety of quality pedestal, wall mount and column type mailboxes to fit your needs. If you have any questions, don’t hesitate to contact us or request a free quote for our mailboxes.